A full bench of the Bloemfontein High Court today reserved judgement in the appeal of the so-called Bophelo House 94. In July 2014 the Bophelo House 94, a group of mostly elderly women, were arrested during a peaceful night vigil outside of the headquarters of the Free State Department of Health (Bophelo House). The women were protesting their dismissal as community healthcare workers (CHWs) earlier in 2014 and problems in the provincial healthcare system. In October 2015 the Bloemfontein Magistrate’s Court found the Bophelo House 94 guilty of having taken part in a ‘prohibited gathering’. Advocate Rudolf Mastenbroek, arguing for the Bophelo House 94, told the court that it was not a crime for the CHWs to have attended a gathering for which no notice was given and that the gathering had not been ‘prohibited’. As in previous court appearances, he argued that criminally persecuting people for attending gatherings was an infringement of their fundamental right to protest. 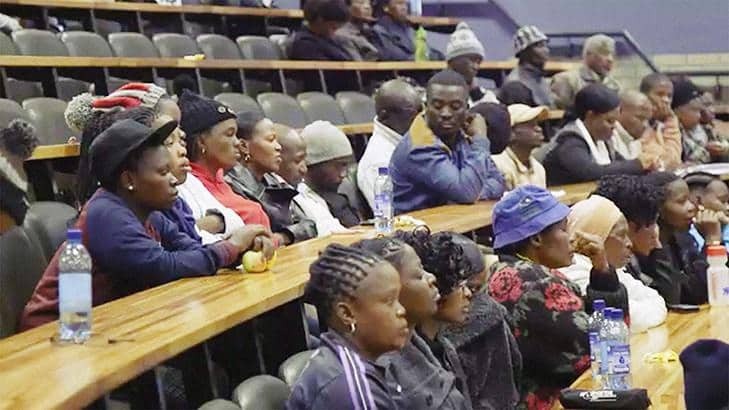 In response, State Advocate Gideon Mashamaite argued that the CHW’s were liable for criminal persecution for attending a night vigil for which no notice was given. He argued that the gathering was prohibited since no notice was given. He further argued that failure to provide notice of demonstrations would prevent law enforcers from doing their job of assessing whether or not a gathering should be prohibited. When court adjourned, the convicted community Health Care Workers erupted in song, singing “Asinavalo, sisebenza kanzima” –(We have no fear, we work hard). The state’s representatives at court declined to comment for this article. Note: Spotlight is published by the Treatment Action Campaign and SECTION27, both of which are involved in this case.